To insulate or not insulate? That should never be a hot tub question! 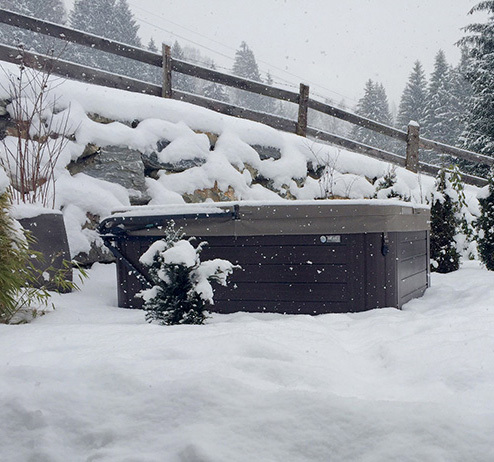 September 28, 2018 – During the quest for a hot tub, we run into customers in our showrooms who bring up concerns about buying a hot tub with insulation. Now, insulating a hot tub that’s to be outdoors 24 hours a day exposed to the elements would seem logical, yes? Hot Spring Spas embark on building hot tubs that will not leak. Now, no hot tub is perfect. BUT: one of the things that allows a Hot Spring Spa to avoid many of the leak pitfalls other tubs experience is because they are fully insulated. Insulation helps support plumbing lines full of water, which will naturally sag once filled. Sagging plumbing lines can put stress on plumbing and jet fittings, eventually causing weakening and increase the chance of a leak. Full foam insulation helps prevent this. Hot Spring uses 5 lb. foam sprayed on jet fittings. Why? Every time a jet pump kicks on to provide hydromassage or to circulate the water for cleaning or heating it creates a “jerk” or torque to all the fittings behind the shell of the tub. If these are firmly supported in place with 5 lb. foam, you don’t experience this repeated torquing, thereby eliminating a key cause for leaks. No insulation? Jet fittings have no support, are not held in place, and increase the chance of a leak developing. My favorite part of the above statement I referenced: “you’ll want to have access, so YOU can fix the leak”. I don’t know about you, but even I, after 23 years in the hot tub industry, would not be attempting to fix a hot tub leak. We have factory trained technicians well versed in how to fix a leak should one develop in a Hot Spring Spa. YOU shouldn’t need to be doing any work like that, and we’d never suggest you do so! Everyone must do their best to sell what they have, and I can’t fault them for selling against the advantages of a Hot Spring Spa. I certainly get that as the owner of a hot tub company. As I said before, Hot Spring Spas aren’t perfect—no hot tub is. But, we have sold Hot Spring Spas for 36 years and have done so for a very good reason: they last, they work, and they have a high rate of consumer satisfaction. Folks come back to us over and over and over to buy a new tub when they need one. That’s not accidental! It happens because the products perform well, and we do what we can to help support it once you own it. Hopefully this will shed some light on why a fully insulated tub is a smart choice. Fall & winter are just around the corner! Visit one of our showrooms today to find out why a Hot Spring Spa is the best choice for you!